Formed in 1904 by a group of 46 musicians who had resigned from London's Queen's Hall Orchestra because of change in policy, the London Symphony Orchestra (LSO) is an ensemble of "firsts." It was the first orchestra in England to set up a self-governing administrative structure, the first to tour North America, and the first to accept commercial sponsorship. Known as one of England's most gifted and versatile ensembles, it is the resident orchestra at London's famous Barbican Centre. 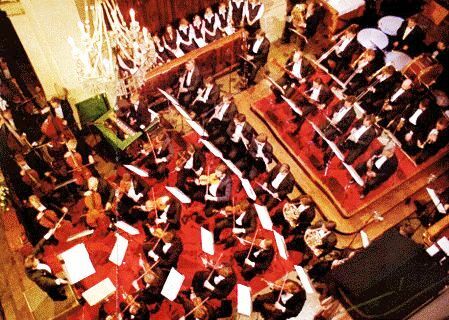 This and the fact that the LSO tours extensively; has provided music for countless films, radio broadcasts, and television productions; and records prolifically has helped to consolidate the group's reputation as one of the world's leading orchestras. During the late nineteenth and early twentieth century, London musicians worked on a strictly freelance basis finding work where they could for the highest possible fee. In 1904, Henry Wood, conductor of the Queen's Hall Orchestra, decided that he could no longer tolerate the chaos of the situation and hired players as full-time employees with a small but guaranteed wage for about 100 scheduled performances a year. Many of the best musicians, who were in great demand and who stood to lose a significant portion of their earnings through this restriction, resigned from Wood's ensemble and formed their own, self-governing orchestra. Soon after its creation, the LSO invited Hans Richter to be its first conductor. He accepted the position on the condition that the orchestra increase its number to at least 100 players. Although Richter conducted a great many of the orchestra's concerts during his eight-year tenure, the group also attracted numerous other distinguished conductors to the podium. These included Nikisch, Steinbach, and Elgar. In so doing, the LSO promoted the idea of guest conductors in English musical society. Two years after its foundation, the orchestra played its first concerts outside England; two concerts in Paris. Under the direction of Nikisch in 1912, the LSO became the first British orchestra to tour North America, presenting 28 concerts in 21 days, beginning and ending with performances in New York's Carnegie Hall. Over the next 50 years, the LSO was lead by a number of gifted and distinguished conductors including Sir Thomas Beecham, Albert Coates , Sir Hamilton Harty, Josef Krips, Pierre Monteux, Istvan Kertesz, Andre Previn, and Claudio Abbado. All of these men, in addition to the many guest conductors and artists invited to work with the LSO, left their marks on the orchestra; shaping and honing the virtuosity of its players into an ensemble of great sensitivity and versatility. The orchestra's association with the film industry began in 1922 when Walter Wanger, head of United Artists, hired the LSO to play for the presentation of silent films at Covent Garden's Opera House. Since then, the ensemble has provided music for numerous films including the Star Wars series for which the LSO won a platinum disc. The LSO's connection with the BBC goes back to 1924 when Ralph Vaughan Williams conducted the orchestra in the premiere broadcast performance of his Pastoral Symphony. The LSO was the unofficial orchestra in residence for the BBC until the formation of the BBC Symphony in 1930 and has continued to broadcast concerts and provide background music for many BBC productions. When Michael Tilson Thomas replaced Abbado in 1987, he set about securing the organization's financial as well as musical future by encouraging the LSO to accept corporate sponsorship. Conducted by Sir Colin Davis since 1995, the London Symphony Orchestra has long enjoyed its well-deserved reputation as a pioneer in several areas of British orchestral history and is a highly versatile and distinguished world-class ensemble. — Corie Stanton Root.